When Mark Rampolla filled a notebook with potential startup ideas, his wife asked him some tough questions. What about this idea is exciting, beyond the possibility of a profit? How will it fit into a life that makes you and your family happy? How will it change the world? Eventually, Mark found his great idea: coconut water. He had seen the developing world use coconut water, but this valuable resource was being discarded in the U.S. 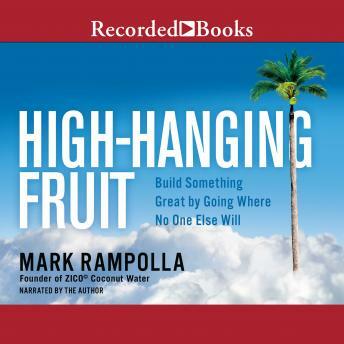 While taking on the beverage industry was a big goal--high-hanging fruit--it was worth the risk because Mark believed passionately that it could change the world. After years of hard work, ZICO Coconut Water became a huge success, and was eventually sold to Coca-Cola for more than $200 million. This book is about harnessing your values to make money and produce a product or service that will truly resonate with consumers, bring you joy and fulfillment, and leave a mark on the world. Large incumbent corporations often try to trick this savvy audience through packaging or advertising, but customers see through it and instead are drawn to insurgent brands derived from the founders' passion and positive impact in the world. A very good look inside the beverage industry. Not a guide, but an inspirational story.